This Whole30 Ranch Dressing is made with healthy fats and fresh herbs. It is creamy and tangy and tastes great on all types of salads. The recipe is gluten free and fits a Paleo diet, as well. Finding commercial salad dressings that fit the Whole30 diet plan can be a challenge. They are out there, but are few and far between. The answer, of course, is to make your own. This dressing is very easy to make and tastes far better than any commercial ranch dressing that I have tried. 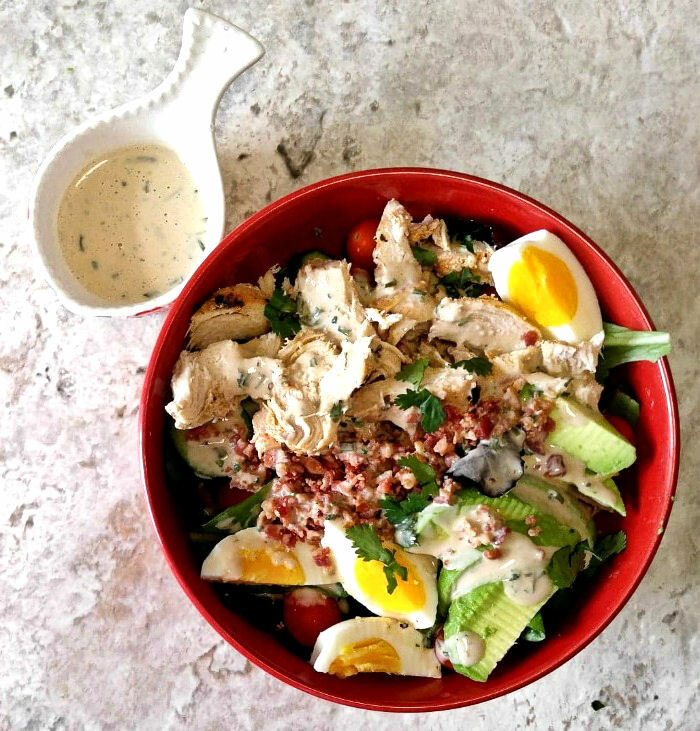 The dressing is a fabulous blend of healthy oils, seasonings, fresh egg, lemon juice, coconut milk and a whole heap of fresh herbs to give the dressing a fabulous taste. 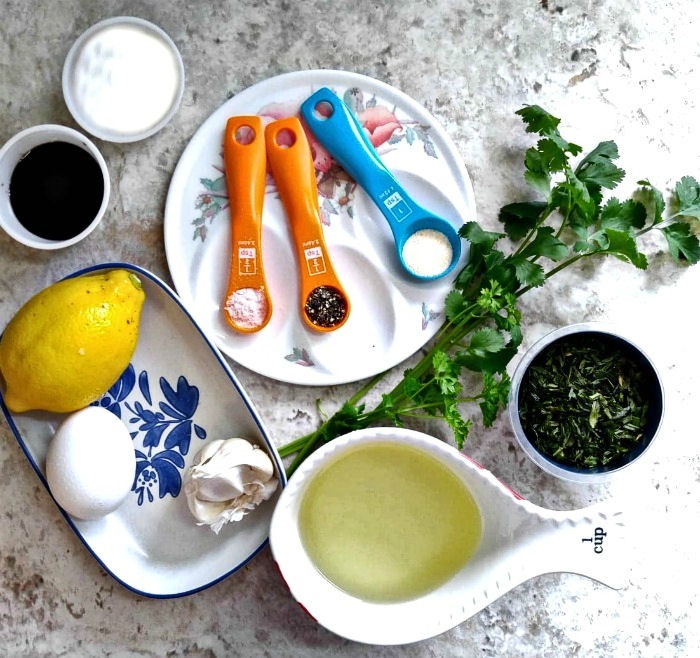 Start by placing the egg, vinegar, lemon juice, seasonings, garlic and fresh herbs in a food processor. Pulse a few seconds to combine. Slowly pour the oil in through the top opening of the food processor while it is still running on a low speed. Once all the oil has been mixed in, add the coconut milk and pulse a few more times to blend well. I store my home made dressing in a mason jar with a sealed top in the fridge. It makes about 1 1/2 cups of delicious dressing. Normal homemade ranch dressing has a lot of mayonnaise in it which is not allowed on the Whole30 or Paleo diet. This gives the dressing a very white color. The ingredients for this dressing are darker in color, and I used a LOT of herbs in this dressing so it has a tendency to go darker in color depending on when you add the herbs and how long you pulse them. Use the lightest colored olive oil you can find. It will be labeled “extra light.” Dark extra virgin olive oil will make the dressing darker. Mince your herbs by hand with herb scissors or a sharp knife and fold them into the dressing AFTER you have added the oil to the other ingredients. 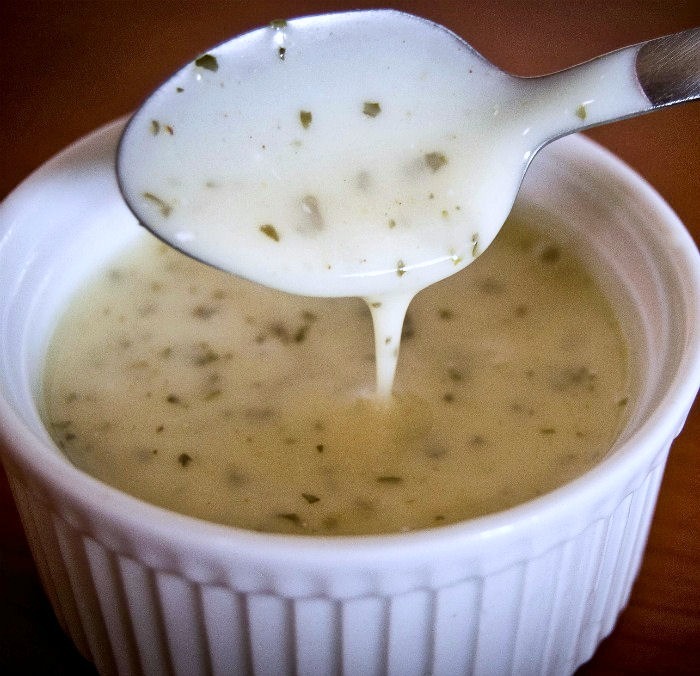 This will give more flecks of herbs through the dressing instead of dulling the color of the dressing itself. This Whole30 Ranch Dressing is Fabulous on Salads. The flavor of this Whole30 Ranch dressing is tart and tangy with a lovely taste of infused herbs. The coconut milk gives the dressing a nice creamy look and texture but does not taste “coconutty” for some reason. It is the perfect dressing for salads. like my California Cobb Salad, to use as a dipping sauce for chicken legs or wings and makes a lovely dip for veggies. 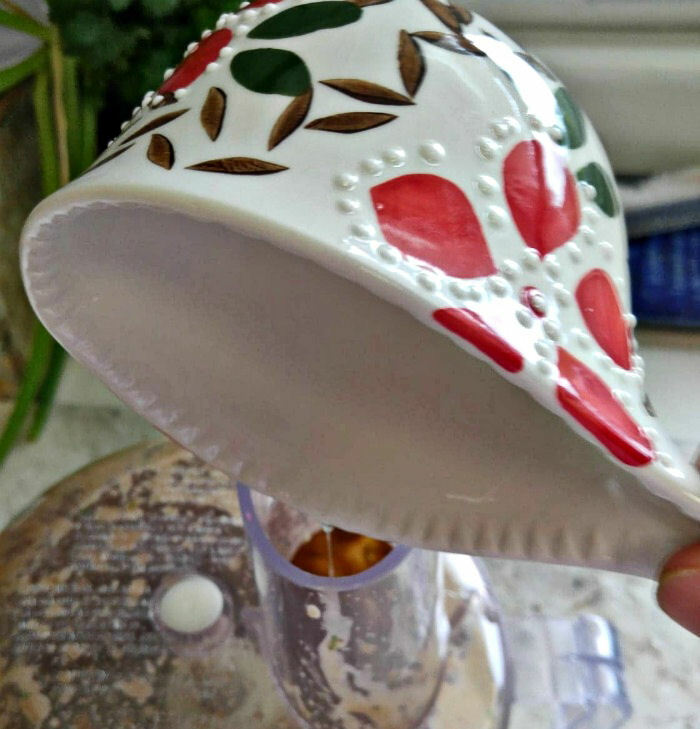 Since it is so easy to make in just minutes, you’ll be able to have a bottle of it on hand all the time in the fridge. It will keep for about a week in an air tight container. But trust me…it won’t last that long! This dressing works out to 127 calories for 2 tbsp of the dressing. 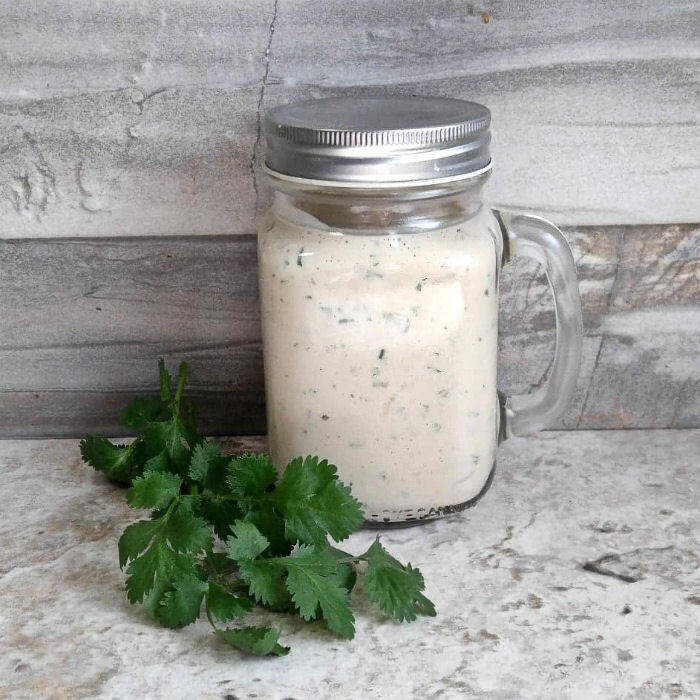 This Whole30 ranch dressing is creamy and tangy and made with fresh herbs, eggs and olive oil. It is great on salads, with vegetables or as a dip. 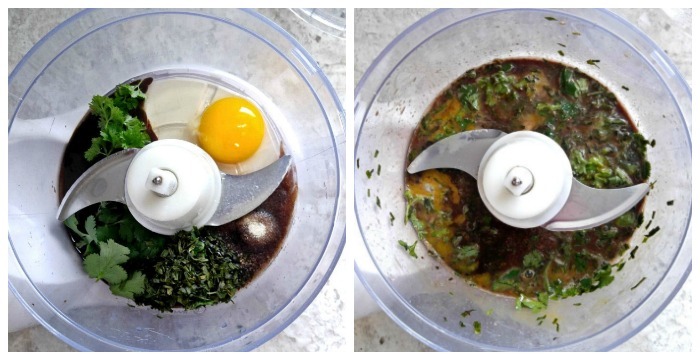 Place the egg, the balsamic vinegar, lemon juice, minced garlic, seasonings and fresh herbs in a food processor. Pulse a few times until the ingredients are well mixed.. Slowly pour the oil in through the top opening of the food processor while it is still running on a low speed. Once all the oil has been mixed in, add the coconut milk and pulse a few more times. 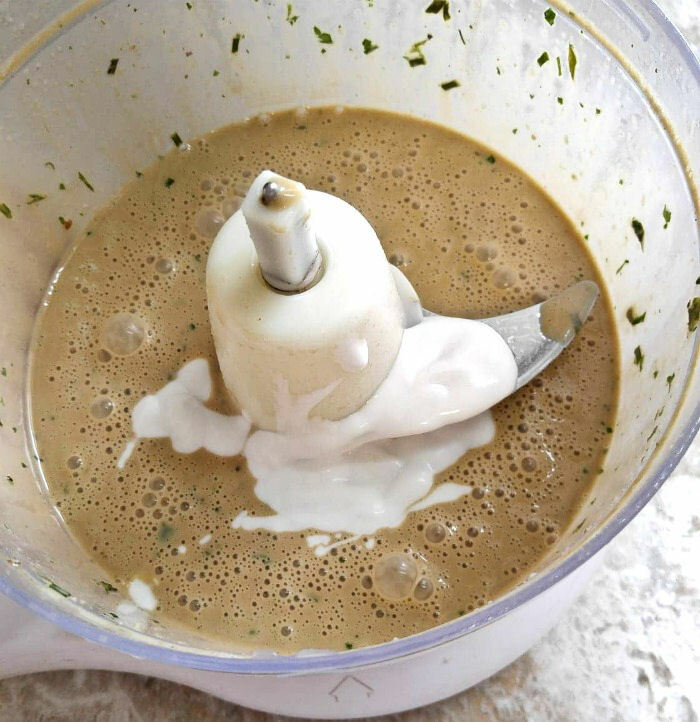 Note: for a ranch dressing that is lighter in color, add the fresh herbs by hand after you have pulsed the oil and coconut milk into the dressing.